The violent unrest in Iran exploded onto the news landscape last week as the rapidly evolving crisis became the biggest international story—other than Iraq—in more than two years. The events triggered by the disputed June 12 Iranian elections filled 28% of the newshole from June 15-21, according to the Pew Research Center’s Project for Excellence in Journalism. That more than quadrupled the coverage from the previous week (6%). Even more notably, it marked the most weekly attention to any international event other than the Iraq war since PEJ began its weekly News Coverage Index in January 2007. (No. 2 was the August 2008 war between Russia and Georgia, at 26%). Several elements combined to drive the coverage of a nation that does not normally generate significant attention in the U.S. press. Those included dramatic and occasionally bloody scenes of unrest in a country where the geopolitical stakes are very high. They also included a narrative with a clear protagonist (protestors demanding reform) and antagonist (forces allied with President Mahmoud Ahmadinejad). There was a healthy dose of U.S. domestic politics here, too. And a momentous media story was at play as a subtext to the main narrative—the role of social outlets in organizing and documenting the uprising. “The Revolution Will Be Twittered” declared Atlantic Media blogger Marc Ambinder. In truth, the social networking site Twitter became a kind of symbol for several forms of citizen media—tweets, blogs, Facebook and homemade video—that have proven instrumental in chronicling events that the Iranian government tried to suppress. Indeed, mainstream outlets—whose journalists faced major restrictions on reporting from Iran—were flooded with the images and words from this homegrown, new-tech media. The news from Iran overshadowed the U.S. economic crisis, which filled 16% of the newshole. That, however, was still the highest level of attention to this subject in five weeks. The No. 3 story, at 7%, was the continued maneuvering over health care reform. That was followed by coverage of North Korea (4%) with the U.S. preparing for a possible missile launch toward Hawaii. The fifth-biggest story, at 3%, was wide-ranging coverage of the new Obama administration. 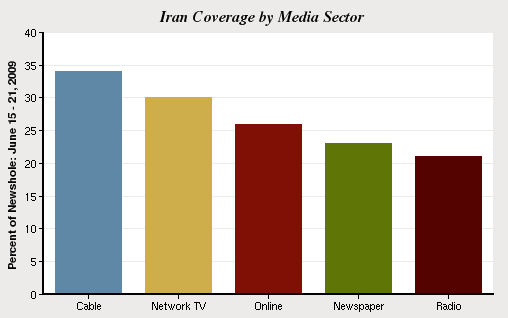 The events in Iran constituted the top story last week in four of the five sectors (the economy led in newspapers), accounting for 34% of the coverage in cable, 30% in network news, 26% online, 23% in newspapers and 21% on radio. But many mainstream journalists were effectively prohibited from covering the story—and that itself became part of the narrative. The New York Times, in a piece headlined “In Iran, Fewer Journalists Each Day,” reported that, “The visas for many of the foreign journalists in Iran are expiring this week, depriving the world of independent sources of information about the violent protests” while noting that some reporters had been detained and beaten. In that environment, much of the first-hand coverage came from grassroots social media sources. And even as many news outlets acknowledged they could not independently confirm these accounts, they became a major component of the overall narrative. Indeed a substantial amount of mainstream coverage discussed the impact of this social media and it was actually the dominant theme in almost one in every 20 Iran stories examined by PEJ from June 15-21. While CBS correspondent Elizabeth Palmer narrated a story about violence in Iran, the images viewers saw came from amateur video showing Iran’s Basij paramilitary force attacking university structures and protestors making their own assault on militia headquarters. Whatever the ultimate impact of the social media upon events in Iran, the role of new media technology was a major element in how the mainstream press told the story last week. While that was a dramatic example of the week’s commentary, the idea of a clear moral choice between the protestors and the Iranian government provided the impetus for another theme in the coverage: Was Barack Obama’s relatively measured approach to the crisis—which toughened somewhat later in the week—an example of smart and pragmatic geopolitics or a mistake that failed to align the U.S. more forcefully behind forces of freedom and change? That U.S policy aspect to the crisis—one tinged with at least some partisanship—became a significant theme. And it featured a match-up between the two 2008 election rivals when Senator John McCain initially emerged as a prominent Obama critic. Despite the outpouring of social media accounts, much was not known about the situation inside Iran last week, including whether and how badly the election might have been rigged. In the absence of some of those details, amid an extremely fluid crisis, one term crept into the coverage as a subtle proxy for regime change. A number of stories mentioned “1979”—the year in which the Shah was overthrown by the Islamic Revolution—to at least conjure up the possibility of a transformational uprising against the nation’s hard-line leadership. By the end of the week, it was unclear whether the government’s intensifying crackdown on protestors would have the effect of curtailing unrest or of ratcheting up dissent even further—perhaps in theform of a national strike. What happens next will clearly help determine how long Iran remains at center stage in the media spotlight. For the third week in a row, coverage of the economic crisis grew again, reaching 16% of the newshole from June 15-21. It was the lead story in newspapers, accounting for 24% of the front-page coverage. The key storyline, accounting for about one-third of the economic coverage, was driven by Obama’s plan to introduce new regulatory oversight of the nation’s financial sector. The No. 3 story, at 7%, was another major domestic issue, the debate over reforming the health care system—and Obama’s appearance last week before the powerful American Medical Association was a major newsmaker. The fourth-biggest story was North Korea (4%) as tensions mounted with the U.S. tracking a North Korean ship carrying suspected weapons and the nation preparing for a possible missile launch toward Hawaii. The new Obama administration was the No. 5 story (3%) with storylines ranging from the official portrait of First Dog Bo (Obama) to new polling showing slippage in public approval for some of the President’s policies. As a central figure with his health care plan, in the economic crisis and as a responder to events in Iran, President Obama’s profile in the news increased substantially last week. It is routine for him to top the list of newsmakers, and he certainly did from J une 15-21, appearing as a lead newsmaker in 14% of the week’s stories. What may be more telling is that this number more than doubled the previous week’s coverage of Obama (6%). Three of the week’s leading newsmakers were major players in the Iranian election drama. 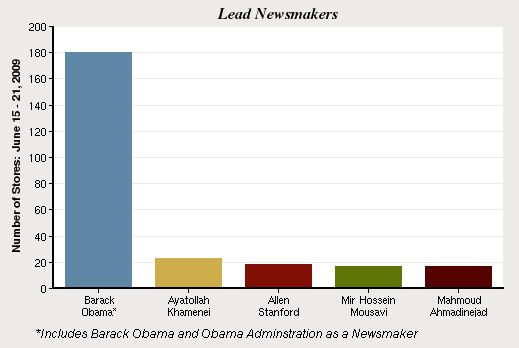 Ayatollah Ali Khamenei, the nation’s Supreme Leader who backed the results, was the second-leading newsmaker, registering in 2% of the stories. Mir Hossein Mousavi, the more moderate presidential candidate whose apparent defeat triggered the protests, was No. 4 at 1%, generating the same amount of coverage as incumbent Mahmoud Ahmadinejad. The No. 3 newsmaker (also at 1%) was R. Allen Stanford, the Texas billionaire charged with operating a $7 billion Ponzi scheme—although thus far, Stanford doesn’t seem to be generating the same level of media notoriety as the man imprisoned on a similar charge, Bernard Madoff.